Photo: Paul Wellman San Ysidro Canyon ring net preparation. Strong winds backed off for a few hours early this afternoon in Montecito, allowing a helicopter pilot to transport heavy duty construction equipment into San Ysidro Canyon, the site of a privately funded safety project designed to protect neighborhoods from another catastrophic debris flow. 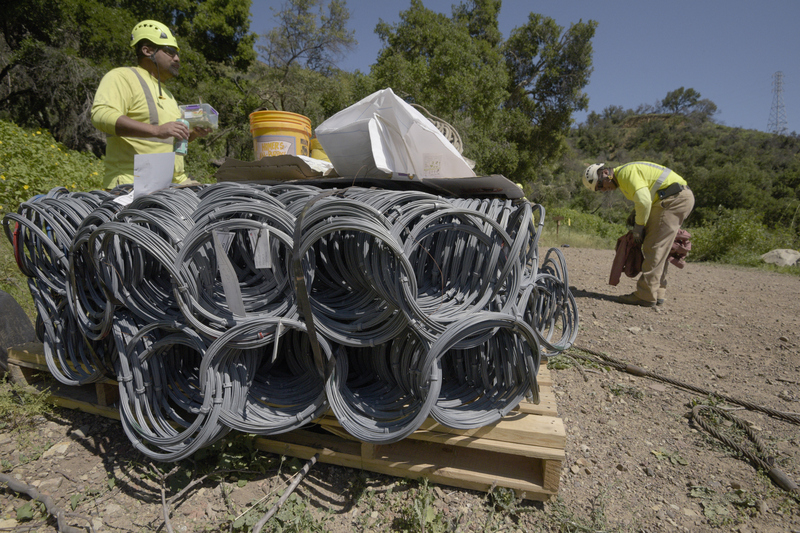 With $4.3 million in donations, The Partnership for Resilient Communities nonprofit group has been permitted to install two so-called debris nets, or ring nets, in San Ysidro Canyon and one net apiece in the east and west forks of Cold Spring Canyon. The heavily anchored steel curtains are engineered to capture runoff — including boulders and trees — dislodged in the mountains by intense rainstorms. The Montecito debris flow of January 9, 2018, which happened a few weeks after the Thomas Fire, damaged or destroyed about 500 homes and killed 23 residents. “It’s amazing to see this happening,” said retired fire chief Pat McElroy, the partnership’s executive director, as he watched the helicopter lift 250-gallon water totes from the fire road near San Ysidro Creek and set them down several hundred yards upstream next to the site of the first net installation. Earlier this week, crews had trucked construction equipment and materials up the fire road as close as they could drive to the net site; the helicopter took it from there. Photo: Paul WellmanA helicopter transports material and supplies the last few hundred yards up San Ysidro Canyon in preparation for the ring net installation in the area. At the drop site, wildlife biologist Justine Cooper with Storer Environmental Services cleared a creekside work area, noting the plant species that would need to be replanted after the installation of the net. She also monitored the delivery of the anchoring gear, including a mixer, generator, water, large totes of concrete mix, and various hoses. The plan is to set the anchor cables later this week and have the first net installed within two weeks; the other nets will soon follow. Cooper said she will also be monitoring the installations, making sure that crew members stay out of the creek and contain any construction waste, including slurry from the concrete mixer. “We’re trying to make the least amount of impact,” she said, explaining that creek corridors provide important wildlife habitat. While the rainy season is coming to a close, the nets still need to be installed under the permit requirements, McElroy said. The nets will be removed when its determined that debris flow risk had been sufficiently curtailed by the return of the mountain vegetation.